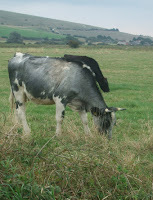 Here's a tale for a Folklore Thursday - The Devilish Tale of the Witch of Rodmell. It is another spooky story that I learnt about while exploring the area around Lewes with the book Ghost Hunter Walks in Sussex. Rodmell is a village by marshes on the edge of the river Ouse, which winds its way from Lewes to the sea. 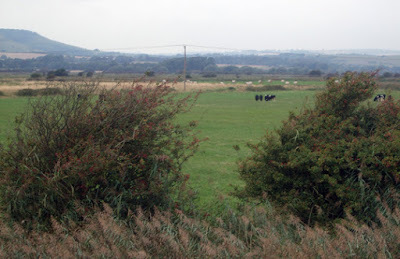 Nowadays the marshes are well-drained farmland, but back in the 18th century they were treacherous, boggy and prone to fog - something a bad-tempered local miller learnt to his cost. It seems the miller had a long-standing disagreement with the local vicar over the night-time ringing of the church bell, which the miller said kept him awake. Neither pleas nor curses would stop the vicar's nocturnal campanology, so the miller decided to up the ante and consult a witch. Now, it seems this particular witch, who lived in a cottage on the marshes, wasn't a nice modern-day fluffy pagan kind of witch. Oh no. The marsh witch was much more the old fashioned pact-with-the-Devil type - and her advice was that only the Old Horny One himself could silence the bell. She even offered to make an introduction, but the miller got cold feet and backed out of the bargain. Or tried to. Certainly the bell wasn't silenced. 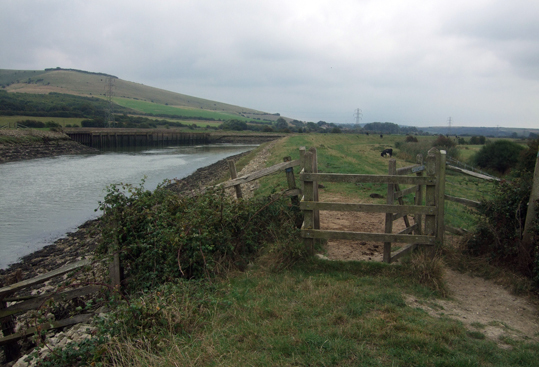 Many years later, one evening when a fog crept in from the river, the miller became lost on the marshes as he was travelling home to Rodmell from Lewes. He was very glad to hear the bell then, as it guided him safely home. The next day he gave a gift of money to the vicar to pay for a second bell and apologised for his earlier anger. However, according to folk tales, it was the Devil who had the last laugh. Perhaps the miller's cash and apology were not enough to save him, or perhaps the Devil was angry at being snubbed, but after the miller died it is said his ghost was doomed to remain forever lost on the marshes. And he is still sometimes seen there today when a cold, thick fog creeps in from the Ouse.